Abdominoplasty Surgery (also known as “Tummy Tuck Surgery”) is performed to remove sagging skin and excess fat from the abdomen. Weakened abdominal muscles causing abdominal protrusion are also tightened. Results are a firmer, flatter and shapely abdominal appearance, which can not be achieved by diet and exercise. Pregnancy causes the abdominal skin to stretch and muscles weakened and separated which often after delivery do not return to normal. Sometimes in older women, obesity and loss of muscle tone can cause a protruding abdomen and a distressing apron of fat. Significant weight loss can also be the cause of a large apron of skin, which needs to be surgically removed. The surgery can be continued with liposuction. The surgery is rewarding, allowing a return greater choice of clothing, attire and improving self esteem. 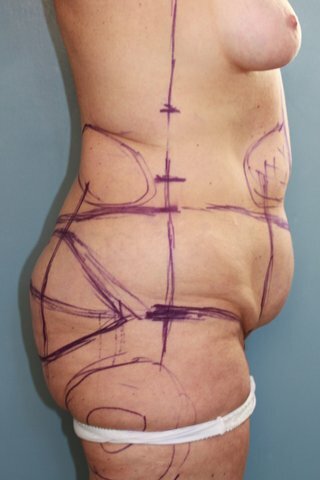 Abdominoplasty Surgery results in a firmer and flatter “tummy”. Excess skin and fat on the abdomen are removed. Protruding abdomen from weak abdominal muscles is corrected to give a well shaped and flat abdomen both in the front and sides. The waist curve is improved, the mons pubis is lifted resulting in a more youthful shape. Liposuction performed to the loin and “love” handles improves greatly the posterior and lateral appearance of the abdomen. Patients are happier and more confident with their tummy profile allowing greater choice of dress-wear.